The Siskiyou Mountains of far south Oregon have no particularly high peaks but are mostly steeply sloping and thickly wooded, cut by many branched, winding valleys, their sides rising to narrow ridges, so the region is crossed by very few roads and the majority is inaccessible. 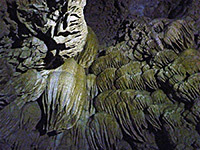 The one major natural attraction in the mountains is Oregon Caves National Monument and Preserve, which is small in area (1 by 0.7 miles) and relatively low in visitation (69,405 people in 2014). 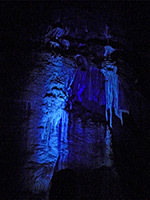 The monument contains a fine example of a marble cavern, featuring all the usual speleological formations - draperies, flowstone, columns, stalagmites and stalactites, etc - and is active in geological terms, the features still growing and changing, in part due to a permanent stream which flows through some of the passages. 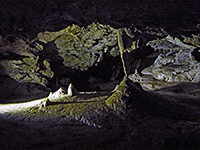 The cave is relatively short, comprising less than three miles of passageways of which half a mile are viewable on guided, ranger-led tours, lasting 90 minutes and staged between May and the end of October; a one way circuit that starts at the natural entrance and exits via a constructed tunnel. 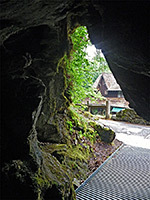 Other points of interest in the national monument are the Oregon Caves Chateau, used for guest lodging, several other historic buildings, and 7.6 miles of trail, crossing the moist, wooded hillsides that surround the cave. At least two days could be spent here though most people just stay for about half a day, enough to tour the cave and relax for a while at the chateau. The 'preserve' descriptor was added to the monument designation in 2014, following a small boundary enlargement. The main highway through the Siskiyou Mountains is US 199, between Grants Pass and Crescent City in California - a wide, well traveled route which in Oregon is mostly lined by dry, flat, pine woodland. The 19 mile side road to the caves (Hwy 46) starts at the small town of Cave Junction, 13 miles from the California stateline, and initially is also level, running along a valley floor past a mix of fields and houses. It enters the forest, remaining flat for another mile or so, then starts to climb and becomes steep and winding in places. En route are two USFS campsites (not always open), and a few unpaved side tracks possibly suitable for free primitive camping, before the road arrives at the wide, elongated parking lot for the national monument. The road continues 1,000 feet further, past the entrance station and information booth, to the visitor center, the chateau and another parking area, for chateau guests only. The total journey time from Cave Junction is about 45 minutes, and the road is fine for all vehicles, though large RVs and similar have to be driven carefully in the latter section. The monument is centered on the upper end of the valley of Cave Creek, and the land on either side is typical of the Siskiyous, rising steeply and densely covered with large, tall, mossy pine and fir trees - an environment moist and shady all year. Cave Creek flows from the cave entrance, underneath the road, over a small cascade into a circular pool, then passes right through the base of the chateau and down the valley. Higher up, it flows for a short distance before disappearing underground. The chateau is a handsome, six story structure clad in dark pine, built in 1934 on the floor of the narrow valley, and because of the sloping land is higher at the back than the front. Inside is a bookstore, restaurant and 23 individually styled guest rooms, costing around $140 per night. The other main building is the Chalet, which contains the NPS facilities, including the visitor center where cave tour tickets may be purchased (2015 cost $10 adults, $7 children under 16). These are not reservable in advance, so busy days may entail a wait of several hours. The tour capacity is 20, and they depart every half hour (less frequently at some times) and last 90 minutes of which at least half is spent stationary, listening to the ranger. Off-trail caving explorations are also offered. 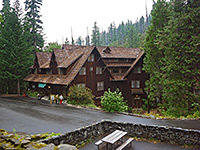 The Oregon Caves Historic District comprises the chateau, the chalet, a dormitory, ranger residence and comfort station. The most popular path in the monument is the Cliff Nature Trail, since a short part links the cave entrance and exit, so almost all visitors see at least this section. 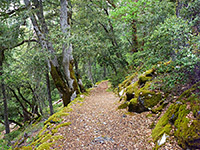 The full route, a loop, is one mile, climbing a short distance up the hillside and passing a good variety of plant life - the Siskiyou Mountains contain amongst the most numerous and varied range of flora and fauna of any mountainous region of the US. The Big Tree Trail is the longest route - a 3.3 mile loop, climbing higher into the mountains and circling the head of Cave Creek valley. The main point of interest is a particularly tall, wide Douglas fir tree. The Old Growth Trail is a half mile connecting path, linking the main parking area with the Big Tree Trail. Starting by the chateau, the 1.3 mile No Name Trail explores a lower elevation section of the monument, looping over the slopes above No Name Creek, a tributary of Cave Creek. Along the way, the Cave Creek Trail branches off, following this drainage downstream, soon exiting the monument into the surrounding Siskiyou National Forest, and ending after 1.5 miles at the USFS Cave Creek Campground. Cave Creek emerges from the mouth of the cave, the same entrance used by the tours, flowing beneath metal mesh flooring, though once inside the stream soon diverges into hidden channels, and the remainder of the tour route encounters only dry passageways. The majority of the half mile walk is through regular tunnels, mostly lacking anything of great interest, but they are interspersed with a dozen wide chambers containing the deposited formations, of which a high percentage are composed of crystalline marble rather than the usual limestone (formed after the rocks were subject to intense heat and pressure). Features include stalactites growing from the roof, stalagmites rising from the floor, columns where the two join, draperies where the deposits are thin and elongated, flowstone where the deposition is continuous over a larger area, and cave popcorn; small, rounded nodules. Some sections of the tour pass through tunnels which are constructed rather than natural, with doors installed to regulate airflow and maintain the moist conditions. Specific items encountered and described by the rangers include a set of 1880s signatures, now encased under a thin layer of transparent calcite, some ancient bear bones, a spectacular waterfall-like formation that glows for a few seconds after illumination is turned off (as do many other places), a volcanic dike, green algae growing due to the artificial lights, brown staining caused by the original floor of asphalt (now replaced by concrete), and a pretty spiral staircase. Visitors are offered the chance to leave after a quarter of the way - via the '110 exit'; the tour is slightly more strenuous thereafter as some passages have low ceilings and are linked by short, steep sections. The very first chamber, known as Watson's Grotto, is accessible to people with wheelchairs. Flashlights and tripods are not allowed in any part of the caverns though flash photography is permitted. Most of the cave is dimly lit, so it can be difficult to obtain good, handheld photos. The deepest reaches of the caverns (including the 'Ghost Room') have the best formations - the most extensive, and the purest white in color. The full tour ends with a walk uphill along an artificial tunnel, emerging 220 feet above the entrance, and 900 feet away.